Do I really have to write anything? The kids faces say it all really. I could of put chopped liver and raw onion in the salad and I don't think they would of even noticed, just as long as there were enough ribs to go round! I can't say enough about how delicious pork ribs are (American style that is, you have to have American style here in Australia otherwise you automatically get Chinese style ribs and they are soooo different). American style have chunks of meat on the bone, you can pick them up like a lamb chop and gnaw until you have sucked that little beauty dry! Chinese style are more like short ribs, they have a lot more fat, you can't pick them up like a chop and the knuckle bone gets a bit chewy after a while but when cooked right, they are also to die for. 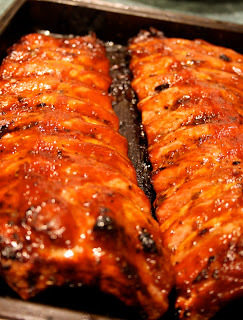 I think the reason I love American ribs so much is the fact they are so easy to prepare as a family meal, not to mention there a kick arse crowd pleaser every single time......With the left over sauce I treated the guys at work to ribs for lunch the following day and they were in heaven. As one of my friends said "these are the best meat sweats I've had in ages"- love it! Ok, so ribs in the oven, happy days, cooking away while I make a yummy shaved fennel and broad (fava) bean salad with a few chunks of cucumber for crunch. Once you peel the beans, it's pretty much 1,2,3 and into the salad bowl. I gave the salad a light lemon dressing, I thought the tang of lemon would go great with the ribs not to mention the oven roasted chips. All my dressings are the standard measurement of 1 part vinegar to 3 parts extra virgin olive oil and added to it I always smash a garlic clove to slowly release the oils into my vinagrette, add a pinch of salt and pepper then shake and leave to infuse. I have never seen Alex eat so may ribs in all my life, I think he must of been on a growth spurt or eating for all the days he missed last week when he was sick. As for Max....well he was in a meat heaven, we didn't hear much from him. These look great! I know what you are saying by "Meat Heaven" I LOVE ribs when they are made right... Slow cooked then slathered with BBQ Sauce. OK dinner plans this weekend covered. ha, haa glad to help my friend- I am busting to do ribs on the grill, it is killing me we haven't got it yet! I am just dying to read your grill recipes! I have so much fun with mine.